For the past few years, there have been a number of quite stellar art exhibitions featuring impressionist or sort of near-Impressionist art in the northern California region. Now the museums seem like they are focusing on more modern art, which appeals less to me. Still, there are lots of shows that sound interesting. Here is a completely subjective sampling. Like Norman Rockwell? Check out J. C. Leyendecker. The Oakland Museum has one of the best collections of early California art around. IMHO. In celebration of the Americas Cup races. I know, Diebenkorn is more modern than my typical recommendations. But every artist working today has to contend with Diebenkorn somehow. Paintings from the SF MOMA collection while that museum undergoes renovation. Among many artists I admire, Anders Zorn is ranked as one of the Big Three among many painters I respect, though he is less well known to the American public. (This Big Three comprises Sargent, Sorolla, and Zorn.) There was a smaller show at the Isabella Stewart Gardiner Museum in Boston earlier this year. This show promises to be much larger, and a chance for those of us not going to Sweden to see his work in person. What shows have I missed that you are looking forward to seeing this year? 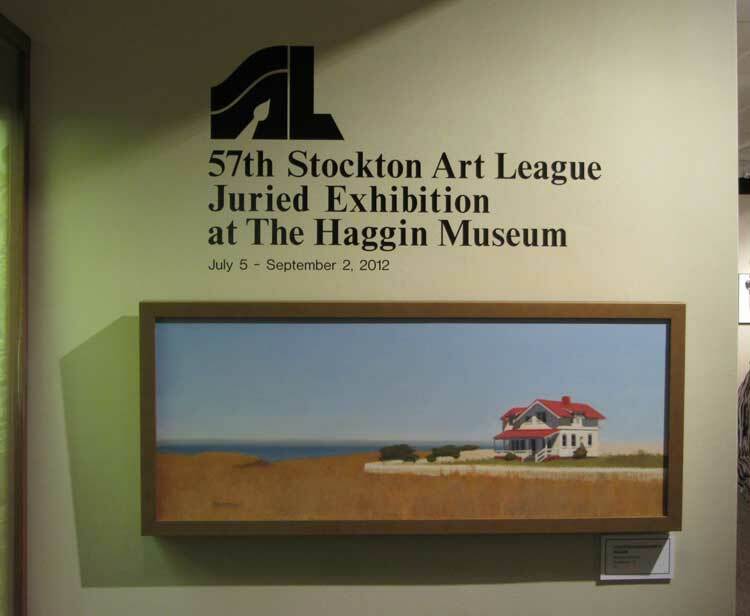 Stockton Mayor Ann Johnston presented 24 awards at the opening gala reception for the 57th Stockton Art League Juried Exhibition at the Haggin Museum in Stockton Thursday, July 5. While your humble blogger was not one of them—they did use a detail from my painting for one of the banners outside the museum! 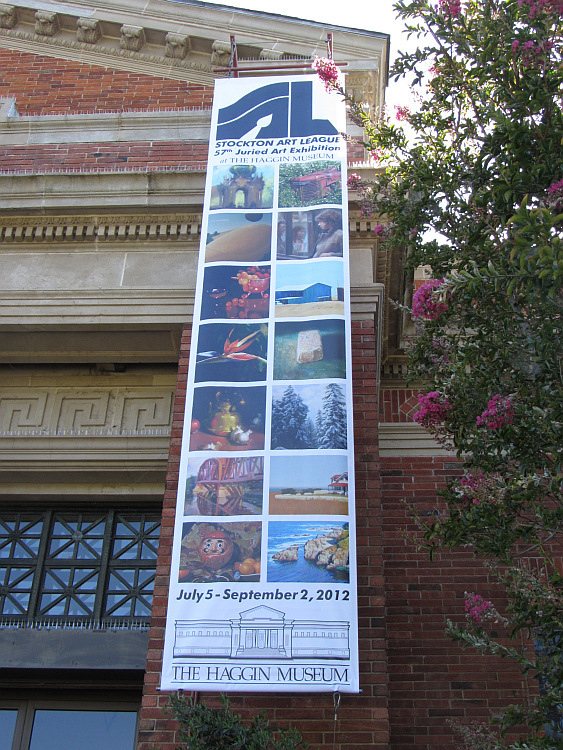 One of the banners at the Stockton Art League Show at the Haggin Museum. The second from the bottom on the right is a detail of my piece. Seriously, I am honored to have been included in this show. The quality of the work is very high. The show includes representational art, including both figurative and landscape pieces; abstracts; sculpture; and pottery. Entries came from as close as Stockton and as far away as Alaska and New Jersey. They hung my painting by the sign for the show. The Lighthousekeeper’s House, ©2012 by Stephanie Benedict. Oil on canvas. 16 x 40. 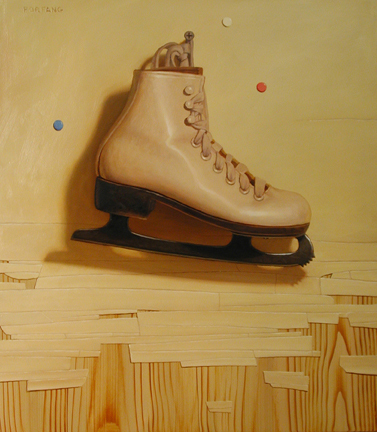 On Thin Ice by Adam Forfang. Oil.16″ x 14″. Used by permission. And if you’ve never been to the Haggin Museum: you’ve missed a gem. 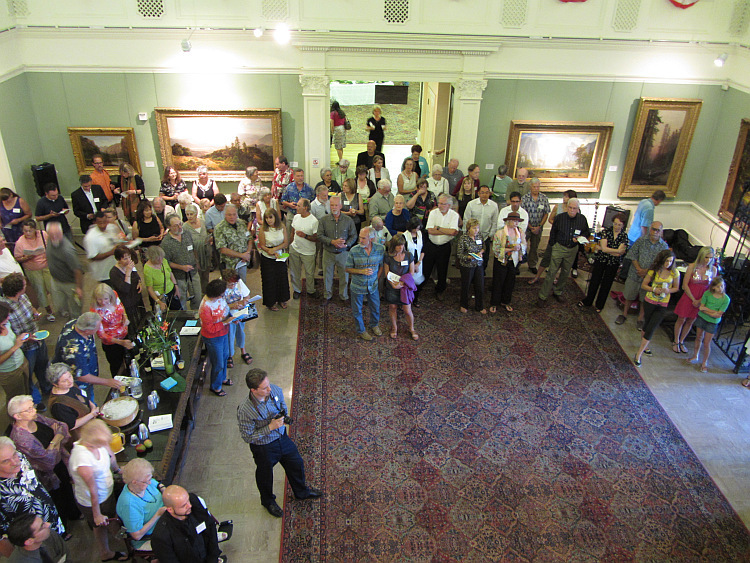 The paintings along the back wall in this photo of the awards ceremony (below) are part of the museum’s collection of Albert Bierstadt and William Keith paintings. And in other galleries there are works by Bougereau, Rosa Bonheur, Jean-Leon Gerome, William Merrit Chase, George Inness—even Gauguin and Renoir. They also have a collection of local and regional historical items, including a 1927 wooden boat. I think it’s great that a local museum teams up with contemporary arts organizations like the Stockton Art League, the Plein Air Painters of America, and the American Society of Marine Artists to exhibit contemporary works, not just historical pieces. Thank you to both the Stockton Art League and the Haggin Museum for including my piece in such a great show! The Stockton Art League show will be up until September 2. I’m very excited that one of my paintings, The Lighthousekeeper’s House, has been accepted into the 57th Stockton Art League National Juried Show. As a special treat, the show will hang at the Haggin Museum in Stockton. The Haggin is one of Northern California’s hidden treasures, and I’m honored to have a piece shown there. The show runs from July 5 to September 2, 2012. The opening reception is July 5, from 6:00 pm to 8:00 pm. I hope you can join me there. The Lighthousekeeper’s House is one of a series of works I’m doing at California’s endangered State Parks. This one is Pt. Cabrillo Lighthouse State Park, in Mendocino. I will donate a portion of the proceeds from the sale of this painting to keep California state parks open. The Haggin Museum is located at 1201 N. Pershing Ave. Stockton. Their phone number is (209) 940-6300. The museum is typically open in the afternoons until 5:00, and first and third Thursdays until 9:00. Admission is $8. For directions, and to see the show online (after July 5), please visit the Haggin Museum’s website.